It is still warm in Seattle. The last few days have made all the grumbling about Junuary worth it. The garden is flourishing along with its weeds. Dahlias are finally blooming and I even spied a red tomato. We still have a long way to go if we plan on feeding ourselves from our garden bounty. If we planned on living on a lettuce, sorrel, raspberry diet, we would be golden. Soon we'll have summer squash coming out of our ears and probably left on your front stoop. I wish I could say the same out some of the other trailing viney things I like to grow. I love cucumbers and I am in awe of anyone who can grow them successfully. Mine are always bitter and tough if I even get any to grow. I am grateful that our markets are full of them in July and August. Iranians love cucumbers and often eat them like fruit. The Iranian cucumbers are picked fairly small, have a thin skin and are not bitter like some of the other commercially grown varieties. They are really eating out of hand cucumbers, with salt and a little pepper. I love them in salads. Iranians are also nuts for salads. Who can blame them in the heat of the Iranian/California summer - a quick salad of tomatoes, onions and cucumbers tossed with some lemon juice, oil, salt and pepper is pretty refreshing and pairs with many different protein sources. I am a big fan of the Persian side salad - Mosteh-khiar (yoghurt and cucumber) which I have seen served as a dip with bread, a salad and in some homes, thinned as a soup. 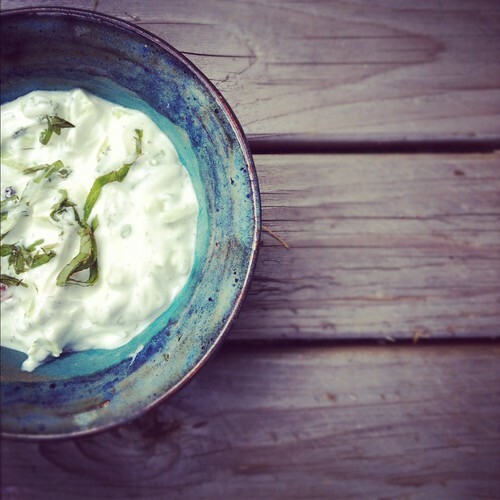 It is similar to the tzakiki served by the Greeks or Raita served in Indian restaurants. Makes sense doesn't it? Same lovely hot and sunny climate, well seasoned food and decent flat breads and a mild cucumber sauce as a foil. It is also super simple to make and tastes even better the following day. Note: My mom used to make this with Mountain High Yogurt, and only Mountain High. She's now making it with Sadaf yogurt, but I like conventional Greek yogurt, because I love the thickness. I love this with or without garlic. TH is not a garlic fan, so I sometimes leave it out. No one seems to mind. If you can't find Persian cucumbers, use pickling cucumbers, they seem to work. If those aren't available, use the English cucumber, but remember to deseed them. In a large bowl, mix yogurt, cucumbers, herbs and walnuts and currants and stir until combined. Season with salt and pepper. If you plan to serve as a soup, thin with water or buttermilk to a consistency you desire. Refrigerate until time to serve. Garnish with leftover mint. For a dip, serve with pita triangles and crudite.